Since 25 years, after the motorcycle and quad, Raid Evasion you will discover the joys and great driving sensations on the Moroccan tracks with the new SSV Buggy 710 cc Wolverine. For it is by forgetting the tourist label, going easily with the public, you will discover the True values of the Kingdom. In the High Atlas, the Middle Atlas, the Anti-Atlas and the Jebel Saghro, discover Raid Evasion mountain tracks of great beauty. If you dream of desert, Chegaga dunes of Merzouga and will make you live moments of great emotion, not to mention the splendor of the Atlantic coast, each region will offer you its secrets. Depending on whether you choose the intimacy of a hostel, the beauty of a hotel or Ksar … but also the magic of the desert landscaped Bivouac, you will always be amazed. We are here to fulfill your dream, fulfill your desire of freedom, your unusual thirst, your driving pleasure. 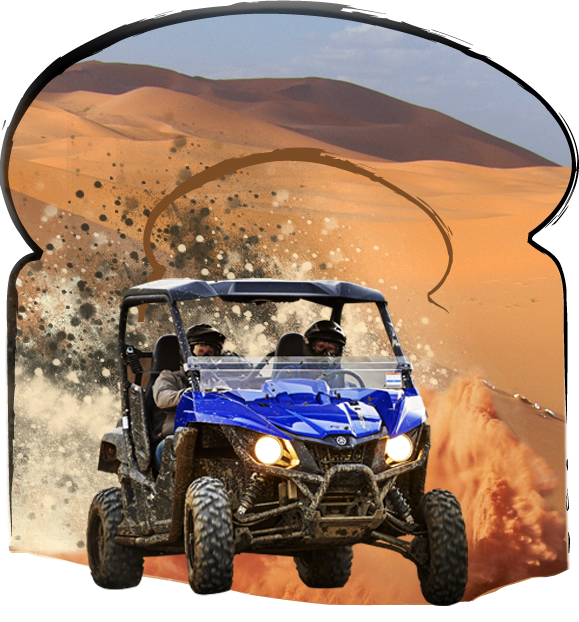 To everyone, with friends, family or as part of a seminar, Raid Evasion will organize hikes and personalized raids SSV Buggy through the most beautiful regions of Morocco from Marrakech. RAID EVASION would like to Welcome!